OpenDNS Umbrella is a cloud-delivered network security service that protects any device, no matter where it’s located.. Where standard anti-virus products deal with problems after they have taken affect, OpenDNS prevents the threats getting in to your network. It’s a vital piece of ammunition in our IT Security toolkit. With more and more employees working from outside of your corporate network, having a solution in place that protects them wherever they are is vital, that’s why here at TechSolvers, we protect all our managed service clients with this additional level of threat protection. OpenDNS lets you manage the Internet experience on and off your network with acceptable use or compliance policies, putting you in control. Manage flexible, location-aware policies with Umbrella’s 60 content categories and an unlimited number of custom block or allow lists. Laptops can be assigned policies with different Internet access restrictions and logging settings based on whether they’re on or off your network. Umbrella informs end-users of the policy with branded, customisable block pages, and offers a feature that enables approved, delegated users to bypass these pages. OpenDNS blocks all known web sites that distribute Malware, virus and other internet nasties including all communications with Command and Control Botnet servers. What more as OpenDNS provides DNS services for over 8% of the internet, they have huge resources in terms of data, and by analysing this data they can detect when new threats emerge, and start blocking them fast. 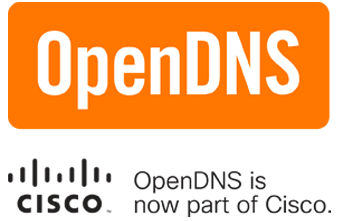 OpenDNS works on the network layer, meaning it can be deployed with no software, no agents and no performance hit on your devices or network. This network based approach also means setting a client up with this service can be done in just a few hours, much faster, and cheaper than other products that aim to provide the same protection. Open DNS have engineered a predictive security solution that anticipates and stops malicious activity before it threatens your network. While the rise of the roaming workforce has eroded the traditional network perimeter, Umbrella by OpenDNS has you covered.